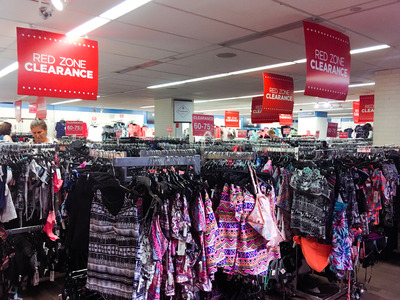 Business Insider/Jessica TylerJCPenney is combating its inventory problem. JCPenney reported second-quarter earnings on Thursday that fell short of Wall Street’s expectations, sending its share price down. In a call with investors, CFO Jeffrey Davis said that the company is focusing on reducing inventory levels, hitting trends, and winning back its core customer: the middle-aged mother. Some analysts are sceptical as to whether JCPenney can execute a turnaround, especially without a CEO at the helm. There’s a bit of a party going on in retail, and apparently, JCPenney wasn’t invited. On Thursday morning, JCPenney reported second-quarter earnings that fell short of Wall Street’s expectations, sending shares tumbling by as much as 25% in premarket trading. JCPenney reported a loss of $US0.32 per share, which was bigger than Wall Street’s estimate of a $US0.05 loss per share. The retailer downgraded its full-year guidance. The retail industry has been strong overall, however. The National Retail Federation reported on Wednesday that July retail sales were up 0.4% on a seasonally adjusted basis from June and increased 4.9% unadjusted year-over-year. “Yesterday’s strong retail sales numbers confirm the fact that there is something of a party going on in retail, with consumers spending in a relatively carefree way. However, this is a party to which JC Penney was not invited,” Neil Saunders wrote in a note to investors on Thursday morning. JCPenney’s same-store sales were up by 0.3% during the quarter. “While other players were enjoying the festivities, it was soundly asleep,” Saunders continued. JCPenney has struggled in recent months. Its former CEO, Marvin Ellison – who was credited with leading the company through a major turnaround effort – resigned in May, arguably before the job was complete, and the company is still struggling to find its place in the retail landscape. “JCPenney hasn’t created an experience that solidifies a place in consumers’ shopping habits,” Kathy Gersch, executive vice president of the consultancy firm Kotter, told Business Insider in May. In a call with investors on Thursday, CFO Jeffrey Davis, who is part of a team of four executives filling the role of CEO while the company searches for a replacement, said that JCPenney had lost its core customer – the middle-aged mum – in a bid to win over the millennial shopper. Davis also outlined the store’s plans to address its inventory issues, confirming that it would decrease inventory levels by at least $US250 million this year. “The time for discussion has passed, the time for action is now. Now more than ever we must be more intensely focused,” he said. Rather than buying inventory to fill store capacity, JCPenney will be “buying and chasing” into sales trends. It wants to prevent being in a position where it has overbought on items that aren’t selling well. Despite these changes, analysts remain sceptical about the company’s short-term outlook. “It is hard to see how the company will turn this around in the near-term, especially with a vacuum in the leadership team. We remain somber about JCP. The company just feels increasingly tired and lacking in spirit,” Saunders wrote.